Three art projects. Two hundred and sixty kindergarteners. One amazing event! We were so honored when Peachtree Corners Business Association approached us to host a project at a Title I school near to them. They generously donated a grant to make the event happen and I wish everyone could have seen the joy and excitement on the kid’s faces as we got started. This event was themed around giving. The teachers wanted the students to create art for the upcoming art show in which a portion of the proceeds would be going to a school in Mexico, and possibly to another Paint Love art project. Paint Love artists don't just paint! We believe writing is an art form and full of creative inspiration. 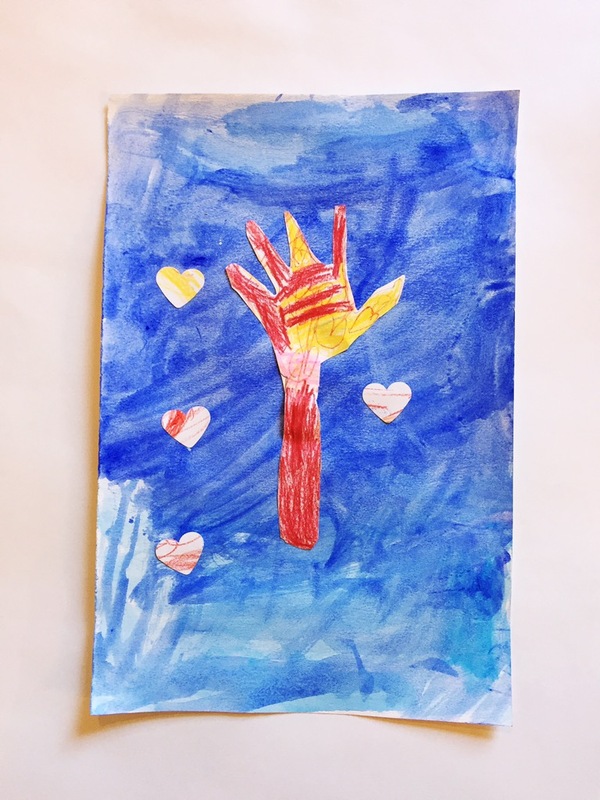 We took the creative mind of children's book author, Dr. Lydia Criss Mays, and turned her ideas into art projects with the help of artist volunteers Christina Wert and & Katey Penton. Dr. Mays did live readings of her book, The Giving Me. She talked with the kids about what giving feels like, what giving looks like, and popular children’s book illustration styles. We split the Kindergarteners into 3 groups. Each group started out in the cafeteria with Lydia. After they were brought back to their classrooms, Christina Wert, Julie and I taught the project. Julie planned the event so that we moved in a wave from classroom to classroom. We never had all 250 kindergarteners at one time. The watercolor and crayon project was easily my favorite. It was based off of Kathryn Otoshi & E.B. Lewis Illustrated books. The kids got to use paint to create background, then trace out their arms. We talked about warm and cool colors. And punched out hearts from their warm color crayon drawings. This marker project was super fun. Lydia was inspired by Mo Willems and we pulled a little bit from Romero Britto’s style. The kids were able to create landscapes and collage on printed illustrations from The Giving Me book. Our oil pastel project was based on the illustrations of Jerry Pinkney. We talked about warm and cool colors and blending. Oil Pastels have such an interesting texture when blended! This was a fun one, because kids were able to get a little messy without getting too messy. They turned out so well! I loved seeing how each child took a different approach. Every piece is different and unique, even though it was the same project. It was such a joy to meet so many creative spirits! A huge thank you to the Peachtree Corners Business Association for sponsoring this opportunity!